Pictures of Rosy, a white-and-brown mare mistakenly painted neon pink by a teen in the B.C. Interior, are providing some welcome levity to residents dealing with wildfires. It's definitely a horse of a different colour. 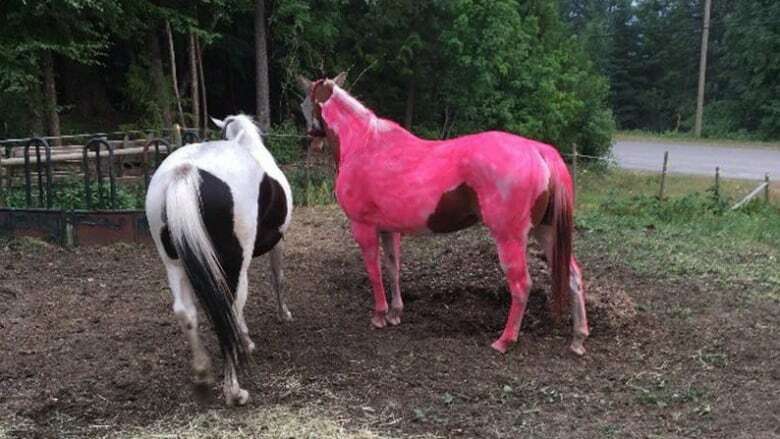 Pictures of Rosy, a white-and-brown adult mare mistakenly painted neon pink by a teen in the British Columbia Interior, are providing some welcome levity to residents dealing with wildfires. Rosy ended up pink thanks to a problem pretty much every parent can identify with — a miscommunication between a mom and her 15-year-old son. Jacob Sharkey said his mother asked him to paint their phone number on 19-year-old Rosy, who roams the family's hobby farm in Likely, B.C., along with another horse. The idea was that if flames reached the property and Rosy needed to be released, the number could lead to her return. But Jacob missed the phone number part. "I thought she told me to just spray paint the entire horse to make it visible, so that way, if we had to let them go, people could find them," he recalled in an interview Tuesday. It took about 20 minutes for Jacob to coat Rosy, ears to tail, in a layer of non-toxic spray paint. "Just bright pink. Bright. Oh my God." Jacob said Rosy didn't seem to mind her new colour. "She's old so she doesn't really give a (care) about anything anymore other than just eating," he joked. "She's a very expensive lawn ornament." The wildfires have stayed away from the family's property so far and Jacob said he knows crews are doing everything they can to keep it that way. While the pictures of Rosy and her story have circulated on social media, Jacob said he's been trying to correct his mistake. "I've still got to go down and scrub the rest of it off."